Choosing the perfect music is a very important part of your wedding day. Of all the instruments, the harp really comes into its own in helping to achieve the right ambience, turning your special day into a graceful and emotional occasion that you and your guests will remember for ever. 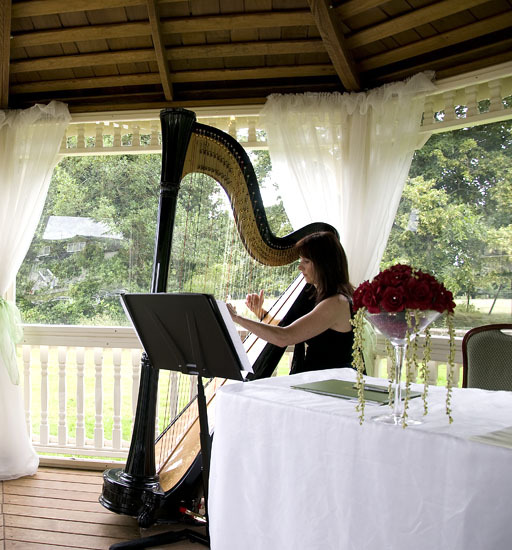 Creating a relaxed, calm atmosphere when played before and during the Ceremony, the harp will lend an air of simple elegance, enhancing those special moments with its rich, romantic sound and dramatic visual impact. After the Ceremony, its beautiful tones will permeate unobtrusively while guests mingle and chat during the Champagne Reception and/or Wedding Breakfast. For a church service, or a civil marriage/partnership, music can be provided at the following points: prior to the Ceremony for the arrival of guests (about 10-15 minutes), for the entrance of the bride, the signing of the register and the exit of the couple. The choice of music is a personal one, though I have made some suggestions in my repertoire page. The harp can help provide a focal point and interest and a welcoming ambience during this rather busy point in the day's proceedings, while guests are chatting and photographs are being taken. When the weather is warm it is possible to take my harp outside if that is where the guests are, provided there is a shady, warm and dry spot on a hard surface available, and that there is no threat of rain. I usually start playing during the 'receiving line', as guests are being individually greeted by the bride and groom before entering the room. I then continue playing throughout the meal until coffee is served, taking one short break halfway. Click on the video below to see and hear Oona playing during a Wedding Breakfast at the Mere Court Hotel, Knutsford. Video by Insight Video Services.